Work-life balance may not always be completely obtainable. But it will never start to tip the way you want unless you take charge of making some changes yourself. 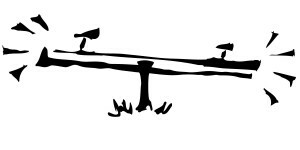 The graphic I chose for today shows a teeter totter wobbling in just one axis but the truth is that work-life balance has a multitude (of axes), just like life. Do you want more time at home each day? Set some boundaries and stick to them. Come and go at set times. From a Michael Hyatt post. Do you want more time at home in general? Are you wasting too much time on commuting? Are you the kind of person who works better on some tasks in certain locations? Push for telecommuting. It’s not for everyone and it’s not appropriate all the time but there can be some amazing benefits. Under the guise of reducing employee commute costs (when gas hit $4/gallon a while back), our management team successfully pushed for a two-day a week telecommuting arrangement. But work-life balance isn’t just about the office-home axis. It can be much more than that. When we bring our whole person to work, we are more effective, happier and more productive. Have you tried that? Are you skilled or talented in something that would be a benefit at work? Maybe you’re a writer and could breathe new life into that operational manual (it’s worth a try). Many of our skills and talents can be put to better use in the workplace if we made an effort. Meet a colleague for lunch at the cafeteria. Maybe you’re near a local food court. Both venues can allow for brown-bagging it. Start a “lunch bunch” and visit different restaurants in the area. Don’t visit one a second time until you’ve covered them all. I’m a hiker. Hiking gets my blood pumping, provides some rhythmic movement, forces a change of scenery and frequently directs my brain and creativity in different directions. Join the gym. A workout doesn’t have to take forever to be effective. If there’s a nearby gym (or better yet, in your building), a quick lunch, workout and cleanup can replace your lunch break from time to time. There are many dimensions and axes to work and life; these are just a few. So take charge of your work-life balance. Get creative about it. It’s your life, not someone else’s. This entry was posted in Other Thoughts and tagged work-life balance, workplace environment. Bookmark the permalink. A walk each day at noon allowed me to blow off steam, stretch some tired muscles, and then reflect, relax, and forget. I returned to the office and found I was always more productive and cheery for the afternoon. I also didn’t eat so much for lunch. A good return for the investment of a good walk, rain or shine. I’m sure there are dozens of reports and studies that back up your findings. As for me, all I need is my personal experience to tell me that you are spot on in your assessment. Yes, I found those “lunch bunch” meetings EXTREMELY useful. Good to level set how things are going across the department, nice to hear trends or just to bounce ideas off each other. “Coffeetime/Coffeewalk” is also equally valuable peer-building and decompression time with peers/teammates. A manager can’t be omnipresent and so can miss much of what’s happening in a department. By utilizing the ears and experiences of his peers in that department (or even wider afield), he gains by hearing from a more extensive network than just the people on his team. Oh yes, and the java jaunt, the caffeinated crawl (aka “Coffeewalk”)—there’s a sense of motion that changes the dynamics of the conversation. Good times indeed.